Please accept this letter on behalf of the Mayfair Civic Association (herein after referred to as “MCA”) as notification that you have been voted this year’s winner of our Mayfair Award. Last year was the second year this award was given out and past recipients include Reese Hartey, past Chairman of the Mayfair Community Development Corporation as well as Monsignor McGroarty, Pastor of St. Matthew. The award is given each year to a neighborhood resident or volunteer that has made a significant impact on our community and has done their part in making Mayfair a better place to live. 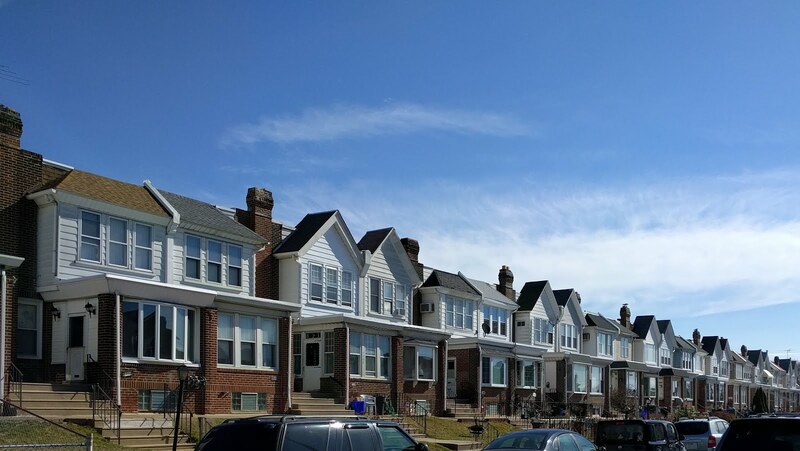 That being said, through your position as our unofficial neighborhood photographer you have captured the hard work and soul of the community in a way that no one could. It is through your lens that we view the events in our neighborhood and it is your photos that have made lasting imprint on all of us. The role of a photographer, especially in this digital age, is often unappreciated; however because of your selfless acts and high level of volunteerism we would like to honor you as the recipient of the Third Annual Mayfair Award. 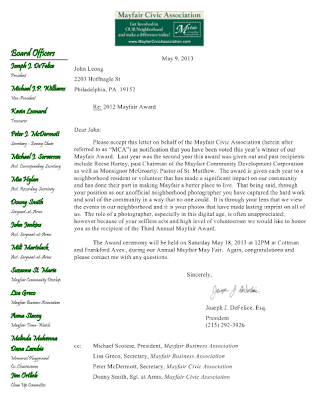 The Award ceremony will be held on Saturday May 18, 2013 at 12PM at Cottman and Frankford Aves., during our Annual Mayfair May Fair. Again, congratulations and please contact me with any questions. At the moment listen to the exact Spring movements of your Four Seasons. We're willing everyone has heard at least huge ability the movements from the Four Seasons. 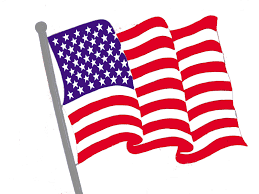 They've got forgotten the music files tradition of ones own nation. Custom designed diabetes shoes also help relieve pressure on deformed parts of the foot.Any pressure on deformities generally leads to pain and stress both of which need to be avoided as it could aggravate the persons diabetic condition.Before you buy diabetic footwear:If you suffer from any kind of foot deformity, foot ulcers, joint pains, etc.You need to pay close attention to the footwear you select.Proper shoe fit is achieved by ensuring accuracy of the shoe shape and size;They must match the shape and size of your foot.Also, the shoes need to have adequate room in the toe area, across the ball of the foot, over the instep, and the heel must fit snugly.Shoe size must also take into account the 3/8To 1/2-Inch gap between the end of the shoe and the longest toe.Also, shoes with laces are generally better as the user can adjust the fit in the event of any swelling in the foot.In-Depth shoes are generally popular amongst diabetics because of the additional 1/4-To 1/2-Inch of depth throughout the shoe.The increased depth allows extra volume to accommodate any needed inserts as well as for deformities commonly associated with a diabetic foot.In-Depth diabetics shoes also generally lighter in weight, have better shock absorbing soles, and come in a wide range of shapes and sizes.If you are a diabetic, taking [URL=http://www.okay2shoes.net/nikeairjordanairjordan8-c-1_16.html][b]Cheap Nike Air Jordan[/b][/URL] good care of your feet is always a priority.Pay special attention to your footwear-Proper footwear can help prevent serious foot problems.Be sure to talk to your physician about the type of shoes, modifications and shoe inserts that are right for you.These days quality diabetic footwear is also available online.Be sure to browse and select the diabetic footwear that is right for you.Shop for best men's women's diabetic shoes, comfort shoes, orthotics more at typefreediabetes.